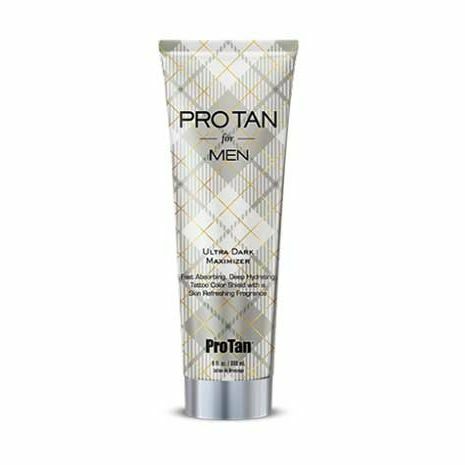 HomeNew Lotions for 2019Pro Tan for MEN ULTRA DARK Maximizer - 9.0 oz. Looking good comes easy with Pro Tan for Men. This Ultra Dark Tan Maximizer will give your skin just the right amount of rich, bronze color to complete your casual yet stylish look. Designed specifically for men this fast absorbing dark tanning formula has all your needs covered with deep hydrating skin conditioners, Tattoo Color Shield and a skin refreshing fragrance for the perfect finishing touch. Dark tanning blend with natural tan enhancers and Tea Tree Oil helps prepare skin for rich, dark, healthy looking bronze color. Skin nourishing brew of Whey Protein and Beer Extract helps hydrate and condition for softer smoother skin.